CS Youth wrestlers show off their medals. Photo courtesy of Kathy Crystal. 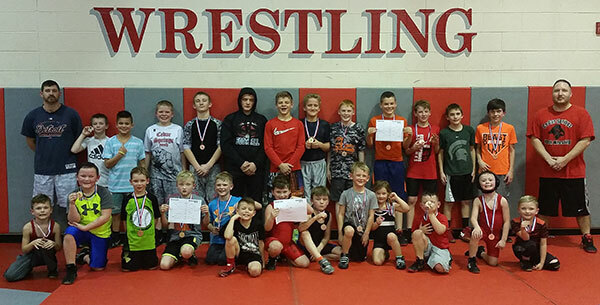 Twenty-nine novice wrestlers from Cedar Springs Youth Wrestling competed at Zeeland East High School in a Novice Duals Tournament on Saturday, January 27. They grappled against Hamilton, Zeeland, Allendale A & B and Byron Center. They finished in third place. Eight Cedar Springs wrestlers headed to Big Rapids High School on Sunday, January 28, to chase the Greights medal. Seven were successful. Chasyn Winchel was 10th overall in pins with 3 in 2:08, his fastest being :33. Karsen Roelofs tied for 53rd with 2 in 1:41, Tucker Crystal was 63rd with 2 in 2:33 and Hudson Crystal was 80th with 2 in 3:26. Tucker Crystal had the fastest Tech for the team and was 19th overall with 2:11. Leading scorers for the day were Tucker Crystal with 28 match points, Jaxon Fitzgerald with 21 and Hudson Crystal with 16. They finished the day 8th in Pins with 11 in 11:14, 19th in Match Points with 109 and finishing the day 18-12. In the 2011-13 age group Karsen Roelofs placed 3rd and Jaxon Fitzgerald took the top spot in the 61lb class. In the 2009-10 age group Tucker Crystal and Chasyn Winchel placed 3rd and Jon Libera took the top spot in the 77lb class. In the 2007-08 age group Dakota Winchel placed 4th and Hudson Crystal took the top spot in the 90lb class. Cedar Springs took 12 wrestlers to West Ottawa for the West Region competition on Sunday, January 28. Conner Dines was 7th overall in Pins with 3 in 2:22 and Tucker Dines tied for 31st with 2 in 2:32. Blake Falan had the fastest Tech for the team and was 11th overall with 3:14. Conner Dines had the fastest pin for the team with :27, tied for 31st overall. Carter Falan tied for 43rd with :33, Tucker Dines tied for 70th with :42. Conner Dines had the most Team Points overall with 27.5 after 4 matches, Tucker Dines had 19.0, Blake Falan had 18.5 & Deegan Pike finished with 16.0. Tucker Dines had the most Single Match Points for the team with 20 and was 3rd overall. Conner Dines had 16, Blake Falan had 15 and Cameron Ellison had 15. The team finished 25th overall, going 18-17 for the day, 11th in Pins with 8 in 8:07 and 10th in Match Points with 148. In the 2011-13 age group Dillon VanDyke placed 3rd. In the 2009-10 age group Tucker Dines placed 2nd. In the 2007-08 age group Donivin D’Antuono placed 3rd, Deegan Pike placed 2nd and Conner Dines (80lb) and Blake Falan (71lb) took the top spots. In the 2005-06 age group, Gabe Gair placed 2nd. In the 2003-04 age group Ben Brunner placed 3rd.